If you’re thinking about taking your child swimming, you’ll need to ensure they have suitable clothing for the activity. Take a look at our free guide to the different types of children’s swimming costumes – it should help you make a more informed decision when it comes to making a purchase. Possibly one of the most popular types of children’s swimming costumes for boys is the standard ‘swimming trunks’. Similar to swim shorts, swim trunks offer a comfortable and safe costume for your son while swimming. Swimming trunks for girls are available, but they are often matched with suitable tops/swim shirts. Swimming costumes are designed for girls of all ages – with a large range of swimming costumes for children available. Again, they are a comfortable and safe option for young swimmers, and come in a wide range of colours and styles. Suitable for both girls and boys, mini wet suits are ‘smaller’ versions of the famed adult wetsuit. They offer whole-body protection and are ideal for children in need of a comfortable and stylish swimming costume designed to keep them warm. Children’s wetsuits are very versatile, in that they often zip on and off, so even on hotter days (on the beach, for example), your child can still enjoy the water without getting too hot. Not only this, but most mini wet suits, as with most other types of children’s swimming costumes, offer SPF protection to your child; helping to protect them against sunburn and sunstroke. Float jackets for children are ideal if your child is just starting out and making their first splashes in the pool. They are warm, safe and offer buoyancy to keep your child above the water. You’ll often find that the jackets have an adjustable buoyancy system – which is perfect for when your child grows and becomes a little more confident in and around the water. Float jackets offer you the peace of mind that your child is safe around the pool. Float suits offer a similar level of protection to the float jackets. The difference is that float suits are full swimming costumes with unique buoyancy devices attached to them. These buoyancy aids can be gradually reduced as your child become more confident in the pool; helping them to become a competent and h3 swimmer. Float suits for children are ideal if you’re looking for a complete safety solution for your child. A sun protection float suit, just like a standard float suit, offers your child a safe and well-supported option when learning to swim. With adjustable buoyancy aids to help your child progress safely through the stages of learning to swim, this type of float suit offers the additional benefit of sun protection – absolutely ideal if your child is learning to swim on holiday, for example. Swim nappies are perfect for smaller children who still wear nappies. They offer a fantastic level of protection within the pool; with very minimal leakage of any liquid or solids. One of the key selling points about swim nappies is that they are re-usable. What’s more, for added protection, they can be worn with disposable swim nappies. 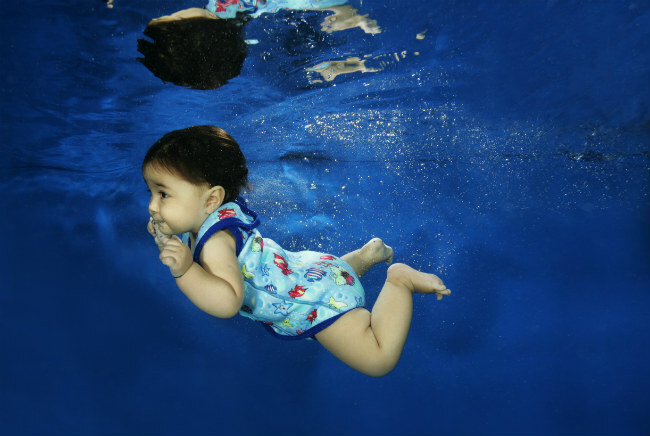 A swim nappy would be ideal for your child if you would class them as a ‘water baby’. So, there you have a guide to the different types of children’s swimming costumes. It’s important to understand the purpose and benefits of each costume – as making sure you have the right one for your child can really help them excel in the pool, whilst remaining comfortable, warm and safe.